The proceedings of Michelle Weinroth and Paul Leduc Browne’s 2011 Ottawa symposium on Morris’s work are now in print. At a weighty 372 pages, To Build A Shadowy Isle of Bliss: William Morris’s Radicalism and the Embodiment of Dreams is a handsomely produced volume and constitutes an important event in Morris studies. But the great surprise of this volume, to those of us who were at the symposium, will be Michelle’s Introduction, which embarks on a stimulating reading of Morris in the light of Jacques Derrida’s concept of ‘spectrality’ from his 1993 Spectres de Marx; for this framework of interpretation was not at all visible at the event itself. This Introduction is exactly the kind of sophisticated writing on Morris of which we need so much more, and of which we get so little. We should be trying out all the major interventions in recent philosophy and cultural theory on Morris’s work, in order to see what they can illuminate in him but also what he, as communist utopian, may tell us about them, by way of challenge and emendation; the traffic will certainly not be all one-way. Efforts in this direction are rare indeed. Long ago, as we emerged from the 1980s, I tried out a consciously ‘postmodern’ reading of News from Nowhere; Weinroth herself evoked the Kantian sublime in her 1996 Reclaiming William Morris; Marcus Waithe used some aspects of Derrida on hospitality in William Morris’s Utopia of Strangers in 2006. But where is the Deleuzian Morris, the Žižekian Morris, the Badiouvian Morris, the Kristevan or Cixousian or Irigarayan Morris, the Bloomian or De Manian or Hartmanian Morris, even a Benjaminian, Jamesonian or Eagletonian Morris, or the Morris of current animal studies or political theology or the Lacanian Real? There are so many powerful paradigms from literary and cultural theory, or from philosophy and political theory, which we should be trying out on his texts. Since the existing Morris institutions are of so little use here, we probably need a new Morris Society that will actively encourage such work and a new Morris Journal that will publish it. So little has yet been done in this field. As with Adam and Eve leaving Milton’s Paradise, the world is all before us where to choose. Thanks, John. Yes, a modern Morris, a postmodern Morris, a hypermodern Morris, even a "postcontemporary" Morris (to use that strange adjective Fredric Jameson was fond of a few years back). Anything, in short, but a Victorian Morris! What we need to find I think, Steve, is a way in which utopian fiction and utopian visions in the other arts can be a more fruitful influence on practical political debate and action. Maybe there could be a whole new academic discipline devoted to that interface! 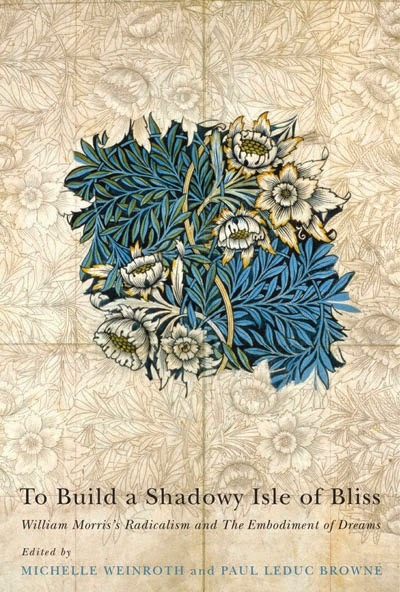 On June 4, a round table will be held during the Congress of the Humanities and Social Sciences and under the auspices of the Society for Socialist Studies, to officially launch the book, To Build a Shadowy Isle of Bliss: William Morris's Radicalism and the Embodiment of Dreams. Speakers at the round table will include Matthew Beaumont, Paul Leduc Browne, Jason Camlot, Nicholas Frankel, Douglas Moggach and Michelle Weinroth. There are plans for a journal issue based on these contributions. More news anon!